It’s Monday! What Are You Reading? is a place to meet up and share what you have been, are and about to be reading over the week. It’s a great post to organise yourself. It’s an opportunity to visit and comment, and er… add to that ever growing TBR pile! So welcome in everyone. This meme started with J Kaye’s Blog and then was taken up by Sheila from Book Journey. Sheila then passed it on to Kathryn at the Book Date. Thankfully, I’ve been doing a LOT better with my reading in September compared to August, so I’ve been inspired to do more currently reading-type updates. I’m in the middle of of a book that I think will become one of my favorite books of the year, if not ever. I’m hesitant to say something like that too soon, because what if something happens and I start hating the book, but I just get such a wonderful feeling every time I pick it up and I’m already thinking about how this will be a great one to revisit and re-read in the future. 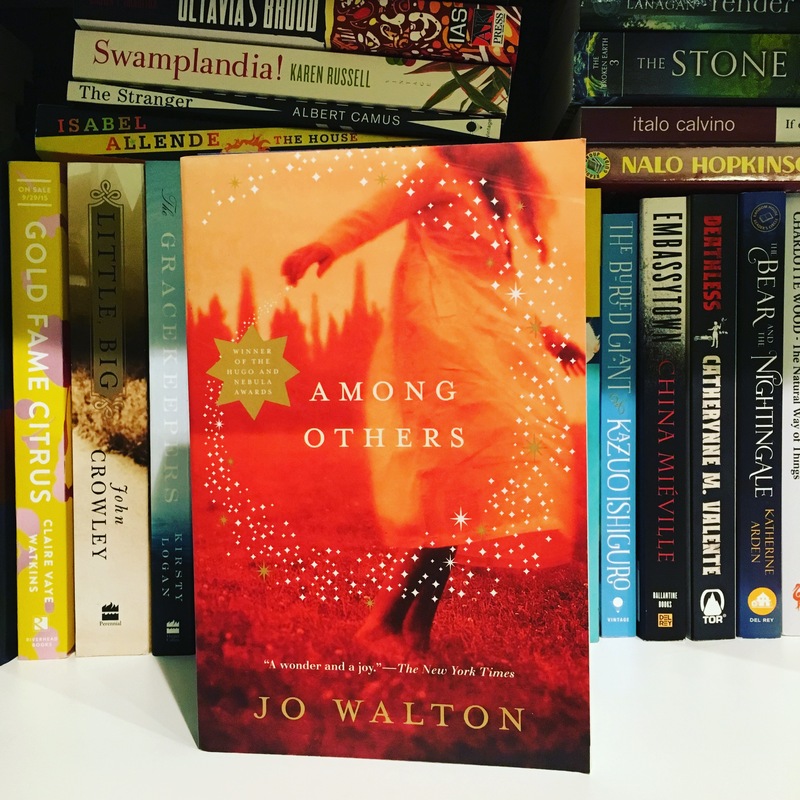 That book is Among Others by Jo Walton, which won both the Hugo and Nebula Awards in 2012 and is about a Welsh teenager who survived a tragedy and is now making it through her time at an English boarding school through a combination of SFF literature and communicating with fairies. Audio-wise, I’m listening to The Girls by Emma Cline, which has been on my TBR since before its release. I’m very much at the beginning, but so far it’s intriguing. I’m also reading The Unearthly by Laura Thalassa, which is a YA paranormal fantasy set at a boarding school also where all of the students are supernatural creatures. Again, I’m very much at the beginning but liking it so far. My most recent physical read was The Brides of Rollrock Island by Margo Lanagan, which was a dark retelling of the selkie myth that was quite good. I also recently finished listening to The Glass Castle by Jeannette Walls on audio, and it was very well-written and compelling but also extremely disturbing and hard to listen to due to its content. If it had been fiction, I might not have been able to finish it, but since it was nonfiction and I at least knew that Walls survived and became successful, I did. What books might be up next? After I finish The Girls, I’m going to need a new audiobook. If the timing works out (I get audiobooks through my library’s Overdrive app), I’m hoping to be able to start listening to Sourdough by Robin Sloan. And once I finish Among Others, I’d like to pick up a book on my list of 5-star predictions; I’m thinking it will probably be Gather the Daughters by Jennie Melamed or The Natural Way of Things by Charlotte Wood, but I’m a mood reader, so you never know. I just finished The Raven King and started Daughter of Smoke and Bone and I’m forever trying to finish Jonathan Strange and Mr. Norrel!! This sent before I finished my comment weirdly, sorry! I’ve been wanting to read The Girls since it came out. How do you like it so far? So far it’s good! I like the style and it’s extremely similar to the Manson family murders. I keep meaning to read Daughter of Smoke and Bone! Loved Jonathan Strange but it’s definitely a giant book, lol. I’m reading Little Fires Everywhere right now – really enjoying it so far!I really enjoyed The Girls last summer – it kept me up at night but in a good way! Nice! I’ve been hearing great things about Little Fires Everywhere.